In previous reviews we already mentioned the following. 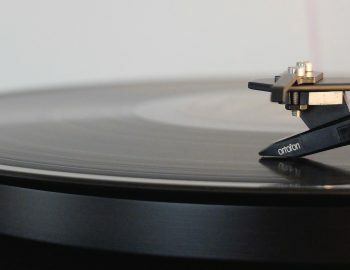 To create a good sounding track you need good mastering but also good sounds. In another blog we already reviewed the Sylenth1. Now it’s time to look at another commonly used synthesizer, namely the Spire of manufacturer Reveal Sound. This soft synth has been around for a while now and is available for well below 200 euros. This isn’t expensive if you consider that this synth has almost the same waveforms as a 2000 euro costing Access Virus hardware synthesizer. 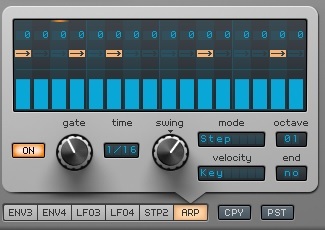 The Access Virus synth was very popular among dance producers. Therefore it’s not surprising that some well-known producers such as Armin van Buuren, Das Berlin and Hardwell also use Spire regularly in their productions. 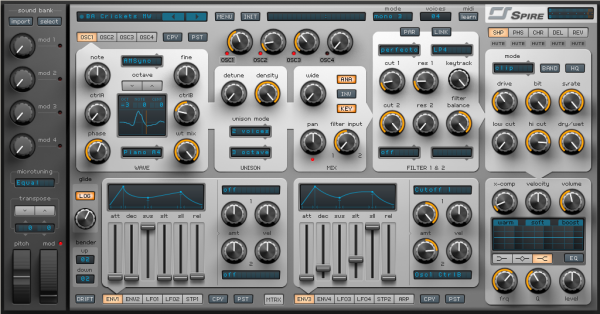 The Spire is available as VST and AU plug-in in both 32 and 64 bit version. The soft synth works on both PC and Mac. The Spire is known to consume more CPU power than other soft synths, eg the Sylenth1. But since Reveal Sound has released the new version in late 2015 the Spire has become a lot CPU friendlier already. In particular the ‘effects processing’ now consumes less CPU power than before. To test whether your computer is fast enough, you can first try the demo version. It also matters what DAW you use the soft synth in. 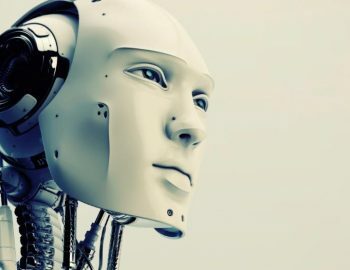 Our experience is that soft synths in Ableton demand more of your processor compared to other DAW, for example Reaper. The demo version is fully functional but occasionally the sound is interrupted by a noise. Of course, the noise is gone once you have registered the Spire. Fortunately registration isn’t difficult. When you register you get an email with a “.lic” file attached to the purchased Spire. Via Menu → Registry you can load the license file. After registering the Spire is ready for use. As seen above, the Spire has a clear layout. It is easy to see which modules the synth consists of. The arrows indicate how the modules are connected to each other. So you can easily follow the path of the signal. The Spire comes with several factory sound banks. In total more than 700 sounds are included. In addition you can buy extra sound banks through various websites. For the Spire lots of sound banks can be found. Among others these are sold by Reveal Sounds themselves. But also through websites like freshly squeezed samples. 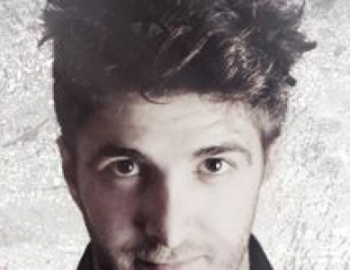 Check the Spire Big Room Essentials bundle by Jan Hinke. The sound banks can be found in the folder where you installed the Spire. The sound banks have the “sbf” extension which stands for “Spire Bank File”. To open a sound bank, go to: Menu → Import Bank. Since version 1.1, there is an easier way to open banks. This can be done via the “import” button top left. Then you can choose a sound bank with the select button. A sound bank can contain up to 128 presets. To give you an idea of what the Spire has to offer you in terms of sounds you can open the bank “Factory2.sbf”. The first preset is “SQ Cretu V”. With this preset you can hear right away how strong the sounds are. It is also possible to create and save your own sound banks and presets. Spire uses 4 oscillators. Each oscillator can be edited extensively. 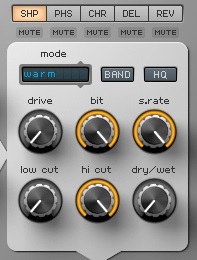 With the OSC1, OSC2, OSC3, and OSC4 buttons you can choose the oscillator you want to edit. With the equally named knobs you can adjust the volume of the individual oscillators. The oscillators can operate in 5 different modes: Classic Mode, Noise Mode, FM Mode, AMSync Fashion and SawPWM Mode. 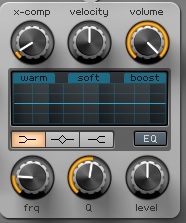 You can edit the sound using the six knobs on the left side of the oscillator. Using the “octave”, “note” and “fine” buttons you can change the pitch. Depending on the mode of the oscillator the buttons “CtrlA” and “CtrlB” have different functions. The button “wt mix” determines the relationship between the selected waveform and the edited version thereof. There are as many as 49 different waveforms available. That’s very much if you compare it with some other soft synths. In the “unison” section we determine how many voices are used. The more voices the fuller the sound. Spire has 9 voices. By using the “detune” button the voices can be detuned relative to each other. The “density” button also influences this. To create your own unique sound this really is a button that you should give a try. Because the unison feature is adjustable for each individual oscillator very powerful sounds can be created. The Copy and Paste functions are also very useful. 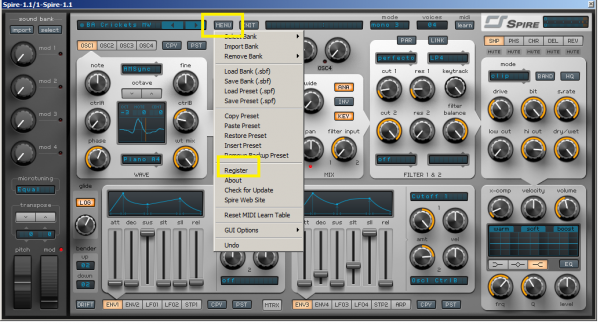 When you have set oscillator 1 you can easily create a copy of it’s settings by clicking the button “CPY”. Then go to oscillator 2 and press the “PST” button. After the Unison section the signal goes through the mix section. If you have used the unison function you can define the stereo image by using the “wide” button. Using the “pan” button you determine the position of the oscillator in the stereo image. The filter button determines the balance between the two filters the signal of the oscillator passes through. These filters are shown below. The filter section of the Spire has two filters. The filters can be connected both in parallel and in series. In the example shown above, they are in parallel. By clicking on the blue text displays you can adjust the various modes and filter type. With the link button you link the two “cut off” buttons. It’s a good idea to experiment with these features in order to fully utilize the filters. The FX section has a major impact on the overall sound of the Spire. The effects in the Spire are very useful. They make the sound even fuller and richer. You can choose from Shaper (SHP), Phaser&Vowel (PHS), Chorus & Flanger (CHR), Delay (DEL), Reverb (REV). They can be active simultaneously. They can be turned off by clicking the MUTE button below the effect. For each effect several parameters can be adjusted. After the EQ section follows the master out. This consists of a compressor and an equalizer. The compressor is of the multiband type and the equalizer consists of 3 bands. Another important part of the Spire is the Modulators section. Amongst others the Modulators section includes four envelopes (ENV1 until ENV4). Using these envelopes you can determine the Attack, Decay, Sustain and Release of the volume of the sound. For example the Attack determines whether you hear the sound immediately once you hit a key or that it’s faded in. And the Release determines how long you can still hear the sound after you release the key. The Decay and Sustain determine what happens between the time of touch and release. ENV1 works for all 4 oscillators simultaneously, the other three are freely assignable. You can link the envelopes to various “controls” as you can see below. Besides the four envelopes also 4 LFOs are available (LFO1 until LFO4). An LFO generates a varying electric current in the low-frequency and often non-audible range. This voltage can then be used to modulate a parameter of the synthesizer. The LFOs are assignable to the various “controls”. Besides the Envelopes and LFOs Spire also has the so-called “Steppers” (STP1 & STP2) in the modulator section. This is a step sequencer that allows you to create patterns. For each step you can choose a separate waveform. Additionally, you can edit the waveforms so you can create your own unique waveforms. 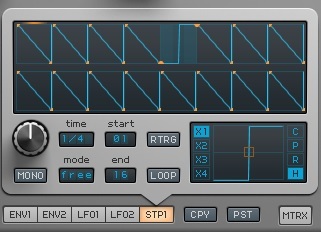 There are some very good presets in Factory2.sbf that are created by using the Step Sequencer. They all start with the letters SQ. When you try “SQ No Good” you immediately hear the sound that was used in the hit No Good by the Prodigy. By experimenting you’ll find out how the step sequencer works. Spire also has an arpeggiator (ARP). It creates patterns of a range of notes. To hear an example of how the arpeggiator works you can listen to the sounds from Factory2.sbf that start with the letters ARP. Again, it is highly recommended to experiment with this feature. Above you see the Matrix part and the Macro controls of the Spire. The Matrix part becomes visible after clicking the “MTRX” button. 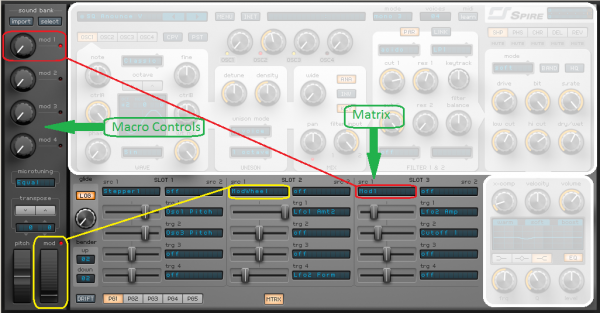 Using the Matrix, multiple parameters can be controlled by one function at the same time. You can see that Stepper 1 controls the pitch of both Oscillator 1 and 2. Also the modulation wheel controls two LFOs. On the left you see the Performance section. This section is new since version 1.1. Among others the performance section contains the Macro controls Mod 1 until Mod 4. 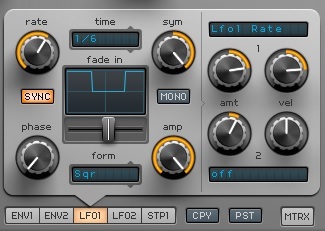 In this example “Mod 1” control LFO2 as well as Cutoff 1. To create a more “hands on” operation you can also link these “Mod” buttons to an external MIDI controller. A handy feature to use the Spire with an external MIDI controller is “MIDI Learn”. This allows you to easily assign the buttons and sliders of the Spire to a knob or slider on a MIDI controller. If you click “MIDI Learn” the word “Learn” lights up immediately. Then click a button on the Spire (for example, cut 1 of the filter). Then move a knob or slider on your MIDI controller. This links the function of this button to the button on your MIDI controller. The Spire is a very powerful and good-sounding software synthesizer. By using the different modes, 49 different waveforms and unique density button very rich and warm sounds can be realized. Also the Spire is an excellent synth for spectacular leads and stabs. It uses more CPU power than for instance the Sylenth1. However since version 1.1 the CPU usage is already greatly reduced. Although sometimes the functions of the various buttons are a bit difficult to figure out it is still pleasant to work with. 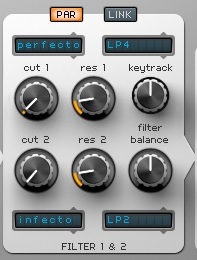 In short, a versatile and affordable softsynth we can highly recommend to everyone.